Everything DiSC Workplace Certification is your best resource to gain foundational knowledge and tools for facilitating Everything DiSC. Designed with your busy schedule in mind, this online course gives you the flexibility of self-paced learning, paired with live-collaborative sessions led by Wiley's expert trainers. Increase your confidence and competence in delivering Everything DiSC Workplace in your organization. This course offers rigorous new content on the principles of the DiSC® model and the supporting research. During the live sessions, you will practice facilitating small groups and explore challenging scenarios that could arise during workshops. You'll also learn how to keep Everything DiSC alive within your organization by creating a culture of DiSC and explore MyEverythingDiSC, the mobile-friendly, interactive learning portal that is exclusive to Everything DiSC. 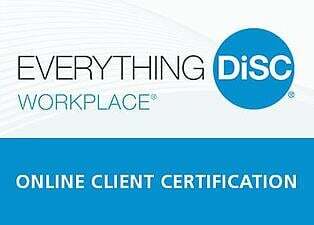 Start your journey toward building your confidence and competence in effectively delivering Everything DiSC Workplace! Click here to learn more. This program requires that you own or have access to an Everything DiSC® Workplace Facilitation Kit. Sold separately.